Gastronomy on top of Paris, meeting on top of London City, moonlight party in Istanbul, wedding in Jaipur stars, VIP step over at Monaco F1, cocktail over Copacobana... the sky is the limit! These and other more events brought to you by Events in the Sky! After seeing this on TV, I have been dreaming of having this kind of setup for my 80th birthday. I hope I'd be rich (and alive) by then, because I assume this approximately costs millions; but I'm sure the guests will feel very fascinated and special when it happens. If only I had 30 x 15 meters of area that can be accessible for both crane and truck with trailer, and 90 meters of steel barriers to secure the area for my dinner party, I'd be all set for this plan! There will be a caterer contracted or at most 3 chefs staying in the center, where they can use electrical devices to cook the dishes in front of my 22 guests. I won't have to worry about the stability, because the design is according to the DIN 4112 norm and is tested every 3 months by BTV (Belgium Testing agency). 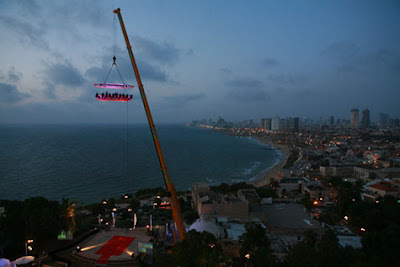 The facilities used for the events in the sky can either be rented out or bought, depending on your budget. Through the existence of Events in the Sky, it has given service to a lot of events (New Year's Eve, Fair, Spa, Dinner, etc. ), brands (HP, Chevrolet, Saab, American Express, etc. ), and countries (Australia, Belgium, Finland, Germany, USA, Sweden, India, etc.). 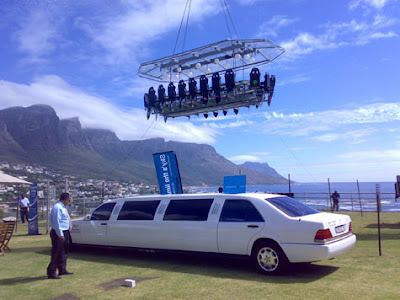 For more information, please visit http://eventsinthesky.com/. As for me, I'll keep on dreaming... who knows? !